In preparation for the construction of VTA’s six-mile BART extension into downtown San Jose and Santa Clara, VTA will begin to gather information about the geological conditions and locations of utilities in the path of the future project. It is necessary to know more about the types of soil and where current underground utilities are located to advance the design of the BART tunnel, stations, and other facilities. Geotechnical investigations provide important details about underground soils and involve drilling and extracting soil samples to test. 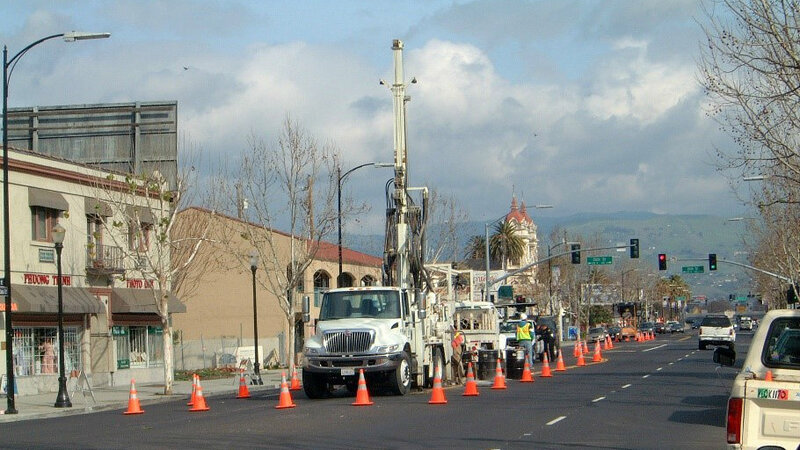 The equipment for this work includes a truck-mounted drilling rig and a cone penetration test truck. Each geotechnical investigation site will take up to five days to complete. See construction map for further details. Utility investigations will reveal the precise locations of underground utilities such as water, power, communications, and sewer lines. A truck-mounted, high-powered vacuum will safely remove a small amount of soil around each utility. The truck and drilling equipment will generate ambient level noise equivalent to a lawnmower. A surveyor will note the exact location and then the small hole will be backfilled. A number of these will be performed in one location over a day span. The pavement will be replaced and the crew will move to the next location. Short-term, intermittent lane closures will occur at locations where this work is being performed to allow for access and to protect workers who will be in the field throughout the project corridor through early 2019. The field work is being coordinated with stakeholders including the Cities of San Jose and Santa Clara, residents, local business and property owners, and others located near the planned work. VTA’s Community Outreach Team has started notifying community stakeholders and will be in the field doing door-to-door noticing as schedules of planned work are finalized. Detailed construction notices are available at http://www.vta.org/bart/construction along with a map where the work is taking place. If you have not already done so, please sign up for Phase II updates at www.vta.org/phase2info.